HTTPS is a lot more secure than HTTP! If a site uses accounts, or publishes material that people might prefer to read in private, the site should be protected with HTTPS. In short: there are a lot of ways to break HTTPS/TLS/SSL today, even when websites do everything right. As currently implemented, the Web's security protocols may be good enough to protect against attackers with limited time and motivation, but they are inadequate for a world in which geopolitical and business contests are increasingly being played out through attacks against the security of computer systems. How often are these attacks occurring? At USENIX Security this year, Jesse Burns and I reported a number of findings that came from studying all of the Certificate Revocation Lists (CRLs) that are published by CAs seen by the SSL Observatory. Those "CA Compromise" CRL entries as of June were published by 10 distinct CAs. So, from this data, we can observe that at least 4 CAs have experienced or discovered compromise incidents in the past four months. Again, each of these incidents could have broken the security of any HTTPS website. 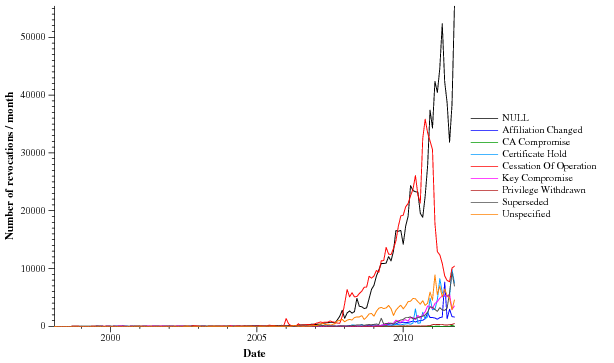 Generally, this plot reflects enormous growth in HTTPS/TLS deployment, as well as the growing strain that its being placed on its authentication mechanisms. The problems with the CA system and TLS authentication are urgent and structural, but they can be fixed. In this series of posts, we will set out an EFF proposal for reinforcing the CA system, which would allow security-critical websites and email systems to protect themselves from being compromised via an attack on any CA in the world.